JAKARTA (Reuters) - Five days ahead of Indonesia's general election, President Joko Widodo retains a double-digit lead over his challenger, retired general Prabowo Subianto, three opinion polls published this week show. The election in the world’s third-biggest democracy is a repeat of the 2014 contest, and the incumbent has been comfortably ahead in most surveys after winning by almost six percentage points last time around. 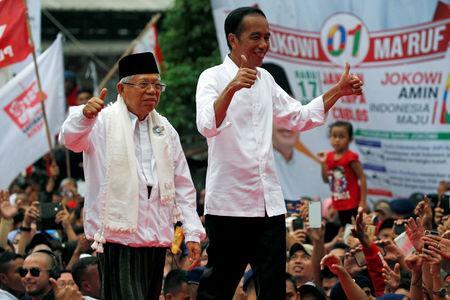 Three recent surveys by Indopolling, Roy Morgan and Saiful Mujani Research and Consulting (SMRC) showed Widodo likely to win between 54 and 57 percent of the vote. Prabowo, as he is usually known as in Indonesia, has between 32 and 37 percent of the vote, the surveys conducted in the first weeks of April show. The SMRC survey published on Friday showed 6.3 percent of voters remain undecided, down from as many as 25 percent several months ago. The opposition has disputed the findings of surveys putting it behind, saying big turnouts at its rallies showed it had far stronger support, as well as its own survey. It has also claimed to have uncovered data irregularities affecting millions of people in the election rolls and vowed to take legal action, or use "people power", if its complaints were not resolved. Several videos appeared online this week appearing to show thousands of voting papers stuffed in bags at a warehouse in neighbouring Malaysia, with many seeming to have been already marked. Arief Budiman, chairman of Indonesia's election panel, said he would send a team to Malaysia to investigate, along with officials from the election supervisory agency. "There's no decision on whether (overseas) voting will be postponed in Malaysia," he said by text message. The agency had received a report from Malaysia that punctured ballots in favour of Widodo had been found inside a plastic bag and a black diplomatic bag at two shophouses, a supervisory official, Ratna Dewi Pettalolo, said by telephone. Another supervisory official, Mochammad Afiffudin, said in a statement 550,000 overseas Indonesians were set to vote on Sunday in Malaysia, with 319,293 due to mail their votes. The Widodo campaign did not immediately respond to a request for comment but a senior campaign official was quoted by the Detik.com news portal describing the incident as an attempt to discredit it. Prabowo's campaign denied any involvement.